Image caption The knitted yarn bomb creations spread over south Essex have been "cheering people up"
A group of knitting fans have been brightening up "miserable" December days for commuters by "yarn bombing" near railway stations. Five post boxes around South Essex have been topped with festive crocheted scenes created by members of Craft Club. Helen Thomas, 40, said the group had received lots of messages about the yarn bombs "cheering people up". "They're definitely staying in place until after Christmas," she said. "People who don't know about us or aren't part of the crochet crowd are happy to see something to brighten up their day." "Parents have been taking their children to the decorated post boxes to send their letters to Father Christmas," Mrs Thomas added. Pictures of the yarn bombs have been posted on Twitter and Facebook, along with messages of support. 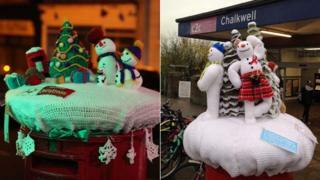 "This festive knitted art made me smile outside Chalkwell station," wrote one Twitter user. "Bringing some Christmas cheer to Leigh station!" tweeted another. Craft Club, which was set up 18 months ago, was the brainchild of five teachers from The Appleton School in Benfleet. The group has done "quite a few" yarn bombs, according to Mrs Thomas, including a world record attempt to gather thousands of crochet items together for a children's hospice, Little Havens. As well as their latest post box yarn bombs, the group has been encouraging people to crochet or knit snowmen, and then swap them with someone else. The "Snowman swap", designed to raise awareness about World Aids Day, saw creations sent to Japan, Germany, Texas, and and all over the UK. Image caption Five snowmen yarn bombs have been made as well as those taking part in "Snowman Swap"